We don’t inherit our values: We choose them. You are here: Home / Key 8. Sense of Place / We don’t inherit our values: We choose them. I have been on a reading overload on Twitter these past few days, i.e. Pre and Post Elections2016, and would like to share a few of my findings there with you. To preface the rest of this posting, Twitter can be shockingly ugly, however I continue to engage there for two reasons: First, it’s amazingly quick and timely; I learn of ‘the news’ there faster than through any other medium. Second, my experience there as a blessedly not-famous person, amounts to who I choose to follow and read; having used it for a while, I know how to filter it well, and I instantly block the haters and spammers. To this second point of curation, I give in to my impulsiveness and change it up there frequently too, e.g. I followed different people while watching the World Series than followed now, while Elections2016 pervades so much. If there’s one thing Twitter is exceptionally good with, it’s tearing down the walls of my comfort zone. It’s an empathy challenge, entreating me to understand more about the rest of the world than I presently do. It’s similar to having the benefits of travel, including travel to perilous places — sort of like a Sense of Place Machine in comparison to a Time Machine. 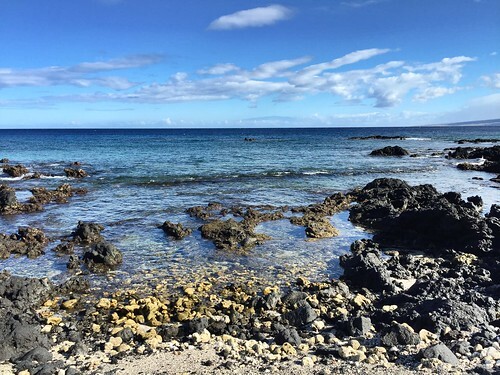 Black lava, white coral, golden algae: Being Home is being welcomed by your Sense of Place. The stories @ShaunKing is tweeting about “emboldened white Trump supporters” are frightening: Please stand against this behavior (safely). Update: Shaun King has followed up with an article on the DailyNews: No, we should not wait and see what a Trump administration does. We should organize our resistance right now. We choose our values. Make no mistake about that. The first gay person I knew personally was my college roommate — a great man who made me a better person. But that’s an experience I would have never had if I didn’t go to college and instead decided to live the rest of my life in my hometown. When you grow up in rural America, denying rights to people is an abstract concept. Denying marriage rights to gay people isn’t that much different than denying boarding rights to Klingons. That really resonated with me: My first complete and true LGBTQ experience of any kind, was living with my gay roommate Neal too, fresh out of college and in the early years of my hotel career before I was married. Decades later, I would have to hold Neal’s hand when he died of HIV/AIDS and his partner sobbed uncontrollably in the next room; they would never get to experience marriage. Hawai‘i is much smaller geographically, yet there are certain microcosms of experience here as well. One we often talk about, for example, is what it’s like when you grow up/live on O‘ahu (more urban) versus on a neighbor island (more rural), each its own generality. I’m often grateful I’ve had the benefit of both. All to say, each of us is similar to Patrick Thornton in some way: As we grow, we change as a consequence of our choices. When we choose where we’ll live, we’re choosing what we will—or won’t experience—as a consequence of that choice. Living somewhere, anywhere, is a Sense of Place immersion in community-based value systems. Me? I grew up with a mostly-liberal mom and a mostly-conservative dad, both who were highly religious in my younger years, and then became increasingly and openly in disagreement with Catholicism as time wore on. I couldn’t believe it when they said we no longer needed to go to church; they only asked that my siblings and I make a totally informed decision (and this became Managing with Aloha’s Learning Landscape: “Know well”). I was blessed with open-minded parents willing to change, and willing to allow me to make my own choices earlier than most young adults got to do so back then. College, a corporate career, and my good fortune in being able to travel quite a bit, made me much more liberal in some ways (e.g. my very strong beliefs in Kākou diversity and inclusion), and much more conservative in others (e.g. Entitlements of any kind have never sat well with me, and I’ve had to work very hard to understand any good within our welfare system). I have become absolutely fierce about the foundation of having ‘good intent’ and a sense of personal responsibility within any practice of the Managing with Aloha philosophy. Hawai‘i has a long history of being predominantly blue, and I married into a family as Democratic as they come. I have voted in every election since I was old enough to register, and I have never voted along party lines; I award my votes to individuals I respect no matter their party alliance. If called upon to identify, I’d probably describe myself as a left-leaning centrist more often than not, especially in current American context, where in my view, there is such an identity crisis happening in both of our major parties. Here are some good definitions on Quora: Politics: What is the difference between Conservative, Liberal, Centrist, Leftist, Right Wing Parties in the modern world? Be willing to explore who you are, and what you believe in. Social issues aside, you may discover a renewed purpose, or your calling. Be bold by being self-assured: Make your own choices, work to self-identify, gaining your own values clarity, and then stand up for your values. Elections 2016 may be over, but our American Experiment with the change to come, is just beginning. Know where you stand, and also know what you have to learn. Ethos: Be True To Your Values.